Memories of a snow-covered Pinyon-Juniper forest, the sound of sheep making tracks in the snow and stars lighting up the night sky are some of the vivid experiences Nadia Lucia Peralta, UC Santa Cruz alumna and member of the Santa Cruz Indigenous Solidarity (SCIS) group, has held close to her over the years of visiting Black Mesa, a shared region between the Hopi and Navajo tribes located 17 miles west of Rough Rock, Arizona. Peralta has driven much needed supplies to the Black Mesa region for the past seven years and will continue to do so this year with other SCIS volunteers. This year will be their ninth annual trip. Every year the Black Mesa Indigenous Support organization requests supplies and donations to continue preserving what is left of their culture and land from the encroaching presence of coal mining. This year that includes building materials, tools, vehicles, portable generators, blankets, food and herb supplies, solar panels and rainwater catchers. “You see that all life is connected to each other, and that can be a really basic blanket statement, but the ways in which these people are standing their ground and protecting their culture and also their ancestral territories and bravely and courageously standing there is yes for their survival, but it’s really for the survival of everyone,” Peralta said. UCSC third-year and co-chair of the Student Alliance of North American Indians, Raymond LeBeau, will be speaking at an event to kick-off the caravan on Nov. 12. People have mined Black Mesa for coal since 1965, operating under the Peabody Western Coal Company. The Kayenta and Black Mesa mines make one of the largest strip mines in the U.S. Strip mining, often criticized for its environmental impacts, is the process of removing soil, rock and debris to expose and extract the desired coal, minerals or bedrock. 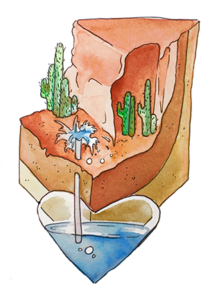 The mines’ use of local groundwater continues to raise concerns about the sustainability of the Navajo Aquifer, the sole source of drinking water for the communities on and around Black Mesa. In 2002, resolutions passed to end the use of the Navajo Aquifer for slurry transportation by December 2005. Slurry transportation is the act of crushing up coal and mixing it with water from the aquifer, which contaminates the water, making it undrinkable. Although this mining process physically endangers the Navajo people and the surrounding tribes, it also violates a much more spiritual tie they have with nature. The idea of being a “guardian of the earth,” as LeBeau refers to the Native American people, is an integral part of Native American belief and spirituality — that everything in nature has a spirit.